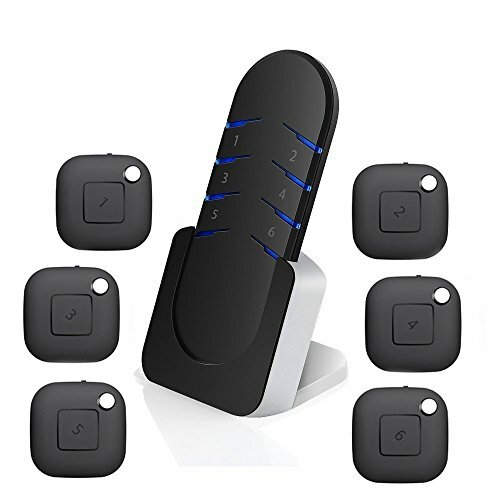 Key Finder / Item Locator Feature: 1.Smart anti-lost key finder(receiver). 2.Compact design,small and convenient,can be put in wallet 3.One key calling,simple to operate. 4.More suitable for finding things quickly when you are in a rush. 5.Ultra-low consumption,standby time for 1 year or more. ONE TOUCH TO FIND - The wireless tracker can quickly and conveniently find your phone, keys, wallet, remote control or your pet when you are in a hurry. EASY INSTALLATION - It is easy and convenient to pair the transmitter and receiver. Two steps to pair: 1. Turn on the receiver. 2. Press any button on the transmitter to pair. BATTERIES INCLUDED - Long battery life of transmitter: Up to 10-12 months with an easily replaceable CR2032 battery HIGH PRECISION QUALITY - High quality plastic makes the key finder more sturdy and exquisite DETACHABLE STAND - mount on your wall or use as stand. WHAT YOU GET - 6 x Receiver, 1 x Transmitter, 1 x Base, 2 x Screws, 2 x Plastic Screw Socket, 1 x Manual, 1 x Box. 24-Month Warranty and lifetime customer service. ONE TOUCH TO FIND - The wireless tracker can quickly and conveniently find your phone, keys, wallet, remote control or your pet when you are in a hurry. EASY INSTALLATION - It is easy and convenient to pair the transmitter and receiver. Two steps to pair: 1. Turn on the receiver. 2. Press any button on the transmitter to pair. DETACHABLE STAND - mount on your wall or use as stand. WHAT YOU GET - 6 x Receiver, 1 x Transmitter, 1 x Base, 2 x Screws, 2 x Plastic Screw Socket, 1 x Manual, 1 x Box. 24-Month Warranty and lifetime customer service. If you have any questions about this product by TSI DEALS, contact us by completing and submitting the form below. If you are looking for a specif part number, please include it with your message.